Therapy dogs are animals that are trained by their owners to visit hospitals, schools and retirement homes. They need to be able to tolerate many different environments and situations, such as loud noises or sudden movements. Therapy dogs provide emotional support and comfort to many people for short periods of time. It is a rewarding experience to work with your dog as a therapy dog. You are able to provide many people with happiness during your visits. Havanese make wonderful therapy dogs. They have such a loving personality that they are able to act calmly around patients and children. They truly feel when someone is sick and needs their attention. 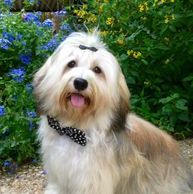 Some of our Havanese have gone on to become therapy dogs! Marla and Happy have been visiting hospitals, schools and nursing homes together since 2015! Happy is an advanced therapy dog and has completed over 100 visits as a member of Divine Canines. Marla has also trained Sonny to become a therapy dog. He was one of the youngest dogs in Divine Canine history to complete the training required. He has also completed over 50 visits and is a registered therapy dog. Emotional Support Dogs are dogs that provide emotional support and companionship to one specific person. Havanese are great emotional support animals because they can recognize how you are feeling at any given time. They are very in tune with our emotions and can adjust their behavior to how you are acting. For example, if you are crying, they will go to you and stay there until you are not crying anymore and they are certain you are fine. Havanese are able to calmly lay in your lap or near you and provide the comfort that you need. 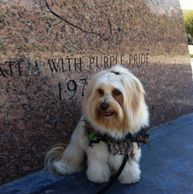 Some of our Havanese have gone on to become emotional support dogs from our past litters.